It's that time, when Facebook is making us all switch over to Timeline. At first I hated the feature, then I realized it's a useful tool. It's impossible to search profiles for specific posts, but Timeline allows you to focus in on a particular month/year. That make it a little easier to find posts. But it comes with a huge 850 pixel photo at the top. Should we use our fiery banner? Make a collage of our favorite posts? Tell us over on the Girl + Fire page! Ordering tuna salad is always a bit tricky. First it has mayo. Icky. Then there's usually the demon cardboard vegetable celery in it. More ick. Truthfully, the mere thought of it turns me off to food completely. To avoid all that nonsense, I make my own, which is better than any I've ever had. I know that sounds terribly arrogant. But I don't like eating the same thing on a daily basis and I've eaten this for the last 4 days. No kidding. I've craved it like a fiend. Put it between two slices of bread and it's a special sandwich. Wrap it in lettuce or mix it with quinoa, even better. Eat it straight, simply delicious. But if there's no mayonnaise, what holds it together? I routinely substitute Greek yogurt for mayo in everything else, so this is no different. And, of course, Dijon mustard. Without mustard, life is far too bland. 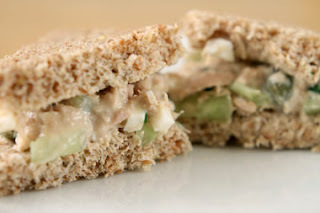 Add in cucumbers for crunch and capers for a sour bite, and you have yourself tuna salad without the ick. 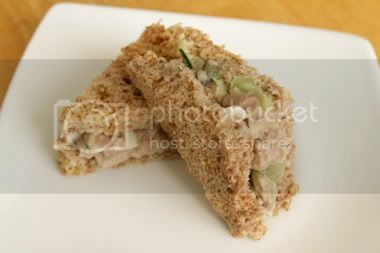 Unless you simply don't like tuna, then there's no hope for you. Add in a roasted pepper and you'll have a colorful plate. Or banana peppers. And pickles for even more sour crunch. But this right here, as is, it's as close to perfection as I've ever gotten in my own kitchen. Which is saying a lot about a mere tuna salad. This is a single serving recipe but scales easily. 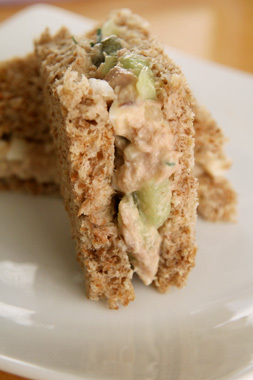 A delicious combination of briny capers, crispy cucumbers, and fleshy tuna married with Dijon mustard and yogurt. In a bowl, mix together all the ingredients. Serve in a sandwich, a wrap, or with crackers. Eggs are considered a near-perfect food. They're full of vitamins, minerals, protein, pixie dust. (That last one might not be true.) They also have all 9 essential amino acids, making them a complete protein. In other words, they're good and good for you. Avocados are considered a super food, also full of pixie dust (maybe). They're full of good fat (the kind that keeps you from getting bad fat), tasty, and are good for your brain. 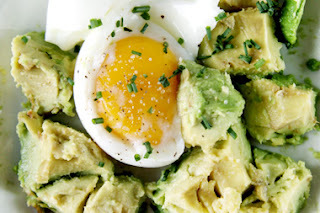 All that science aside, you combine eggs with avocados and you have a delicious breakfast. Dice an avocado, snip some chives, sprinkle some truffle salt, crack some black pepper, and you have breakfast. In just over 3 minutes. Break the yolk and have at it. A quick and easy meal, as easy to make for breakfast as for a midnight snack. 1. Cover egg with about an inch of water. Bring water to a boil and let boil for 3 minutes (4 minutes for larger eggs).2. While the egg boils, cut open the avocado. Using a sharp knife, cut all the way around the large pit and twist open. Leave the pit in one half, and run the knife in parallel cuts along the long axis of the other half. Then cut perpendicular lines in the flesh and scoop out with a spoon. 3. After 3 minutes, remove the egg from the heat and shock with ice water to stop the cooking. Gently crack the egg and split in half, leaving the yolk on one side. 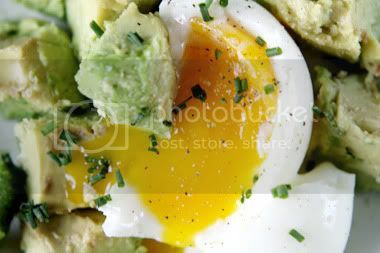 Scoop out with a spoon on top of the avocado.4. Sprinkle salt and pepper (truffle salt if you have it), and any other condiment (salsa, maybe?). Break the yolk and enjoy. It's felt like summer here in Los Angeles all winter long. There have been a few relatively cold days, but mostly just unseasonably warm. Since it feels like summer, we've been having summer cocktails out on the patio. 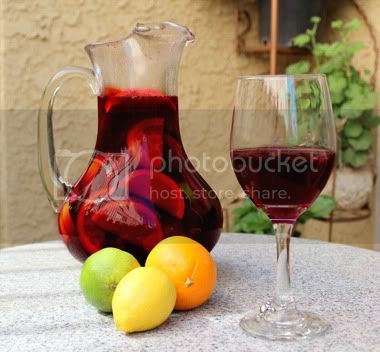 Sangria hails from Spain. Some generations back, both sides of my family do too. So, you could call this a family recipe. Especially since I created it in my parents' kitchen. We were having a party. Well, I was using their house to have a little afternoon party. It's like I was a teenager and we were raiding their liquor cabinet. Except we were all adults and...I was raiding their liquor cabinet. But I did bring my own wine. Read the part about being an adult; my parents raised me right. I also made all kinds of food. The kind you've read about. Like spinach in a lime vinaigrette (a riff on the semi-raw kale salad), kale pesto, little wonton cups to eat them out of. But the yummiest part of the afternoon was the sangria. 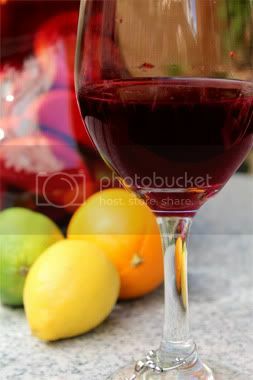 2 bottles of Charles Shaw nouveau table wine, a liter of ginger ale, a cup of brandy, a bunch of sliced oranges, lemons, limes, and nectarines gets you a quite tasty concoction to ladle out of punch bowl. Other recipes will tell you to add sugar, strawberries, better wine, etc. You can do that. You can also keep it simple and do what I did: use a wine you've never tasted, betting that it will meld well with whatever brandy was in my parents' liquor cabinet. It was a stroke of luck. Letting this combination sit for about an hour gives the flavors time to mingle and marry. And then you'll have a delicious good time. 1. Add all the ingredients into a large punch bowl, stirring to combine.2. Put in the refrigerator for about an hour to allow flavors to meld. 3. Ladle into your favorite glasses.